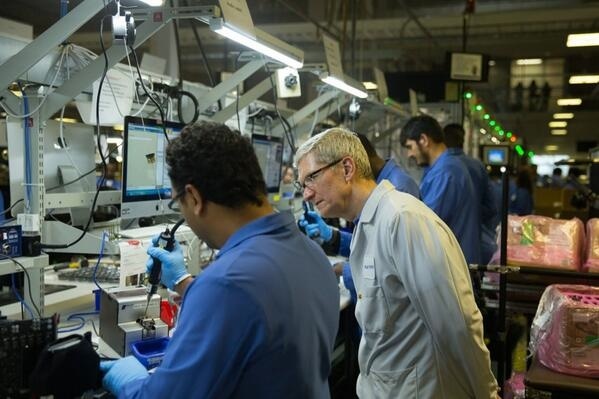 While it was revealed yesterday that Apple executives Tim Cook and Eddy Cue had visited the company's new operations campus in Austin, Texas, Cook has just tweeted a photo of a second visit he made to Apple's nearby Mac Pro manufacturing facility. Apple's Mac Pro manufacturing facility is run by Flextronics as part of an initiative to bring manufacturing of some Apple products back to the United States. While it is currently a limited effort given the relatively low volume of Mac Pro production, it has received considerable attention. Flextronics' Mac Pro facility is roughly a mile from Apple's new Austin campus, which is actually an expansion of the company's long-standing operations campus in the city. The campus expansion is major effort that will see Apple investing $300 million to add at least 3,600 workers at the site by 2021. The overall project will encompass roughly one million square feet of space, with the just-opened first phase including two out of a planned six buildings on the site. Following the visit to Apple's facilities in Austin yesterday, Cue was also spotted in the stands at last night's Game 1 of the NBA Finals just down the road in San Antonio. 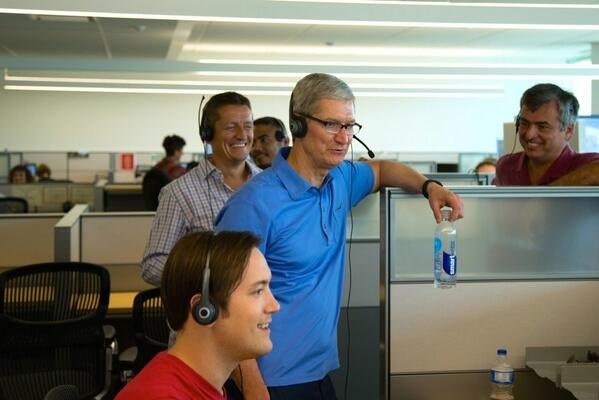 Update 9:27 AM: Cook has also tweeted a photo of his (and Cue's) visit with the AppleCare team at the operations campus in Austin. It really looks like those iMacs are running windows? You're post shows so much ignorance, Seriously. With that type of attitude things will remain the same. Is that what you want, to be monopolized by Microsoft? It's not like Macs are just a hobby. That's exactly what you're suggesting. There's absolutely nothing about Windows in general that can only do that type of work. It's lazies that refused to create and consumers with your type of thinking that will keep everything the way it is. Very poor. My post is just reality, backed up my the proof on those images. Apple has sourced the software they need to do the job and it runs on Windows. Why? Because the software they require on OS X simply doesn't exist. Also, calm down. It's just software. I tip my hat to that worker, I cannot work normally when someone is standing over me like that. Let alone the CEO lol. Thrice the salary for the workers, thrice the quality of life, thrice the quality, and thrice the average age of the workers. Let's face it, having 12 year-olds work for 15¢ an hour near factories that spill toxic chemicals into rivers and spew toxic fumes into downwind major cities is not a sustainable way of doing things. Cheap, fast, good...pick two. There's a light gray bar at the top, so I'm guessing VMWare Fusion or Parallels. When you're talking about electronic hardware and testing equipment, a lot of it only has Windows software so it's not like they have a choice. Also, can anyone spot anything that might look like a Mac mini on that photo? Answer the question. You didn't even do that. Being rich is not a financial motivation. Again; how would apple benefit from being forced to design their own software in an area they have no expertise in - when there is perfectly functional software that already exists which they simply need to license. Not only that, they get workers and administrators that know how to manage those systems. It may make more sense if they increase the scale of their operations. Right now however the scale is far too small. I don't care if Apple uses Windows to DESIGN Macs......all I care about is using a Mac. There's absolutely nothing about Windows in general that can only do that type of work. Nor did he say that. Theres no financial motivation for it, and little sense in it. Manufacturing is heavily reliant on hardware and software that can be acquired for a very long time, and that can be expected to run for and exceeding a decade. If anything breaks, you need to be able to replace it without creating a 'mixed environment' problem. That means being able to both install operating systems that are extremely old (Which apple does not permit with OSX) in order to ensure correct behaviour and working software, and to have the correct IO interfaces to communicate with your environment, which apple also does not guarantee. Baby steps...but it makes me damn proud to see manufacturing of Apple products in the US again.